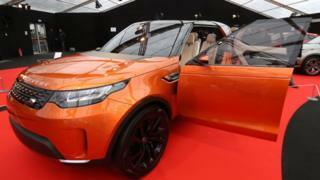 Jaguar Land Rover (JLR) is planning a two week shutdown of its Solihull plant at the end of October. Britain's biggest carmaker blamed weakening global demand, especially in China, and has faced falling diesel sales in recent months. JLR said employees at the West Midlands plant would be paid for the duration of the shutdown and no jobs would be lost. The Unite union called the news deeply troubling, and said government policies were to blame. Unite national officer Des Quinn said: "Government ministers' trashing of diesel, despite the UK making some of the cleanest engines in the world, combined with their shambolic handling of Brexit is damaging the UK car industry and the supply chain. "Add into the mix the government's half-hearted support for the transition to electric and alternatively powered cars and you have a triple whammy facing the UK's car workers." In a statement on Monday, parent company Tata Motors said total sales at the firm fell 12.3% in September to 57,114 vehicles. It blamed a 46% slide in China, its biggest market, where rising competition ongoing trade tensions held back demand. "As part of the company's continued strategy for profitable growth, Jaguar Land Rover is focused on achieving operational efficiencies and will align supply to reflect fluctuating demand globally as required," the firm said in a statement. "The decision to introduce a two-week shutdown period later this month at Solihull is one example of actions we are taking to achieve this. "Customer orders in the system will not be impacted and employees affected will be paid for the duration of the shutdown." The Solihull plant, where the firm makes Range Rover and Jaguar models, will close from 22 October. It follows a move to a three day week for 2,000 workers at the firm's Castle Bromwich plant and an announcement in April to lay off 1,000 workers across its West Midlands' plants. The UK car industry has been struggling in recent months, as diesel sales fall and carmakers face tougher new emissions standards. The number of new cars registered in the UK dived by 20.5% in September, according to industry figures, following an unusually strong August and a turbulent first eight months of the year. Manufacturers are also increasingly vocal about the potential risks of Brexit. They fear that an end to frictionless trade would disrupt their "just-in-time" supply chains, hurting production. In the last few weeks, Japanese carmakers Nissan, Toyota and Honda have warned that a no-deal Brexit could hit output and profits. And in September, BMW said it would have to shut the Mini factory in Oxford for a month after Brexit if the UK failed to secure a trade deal with the bloc.